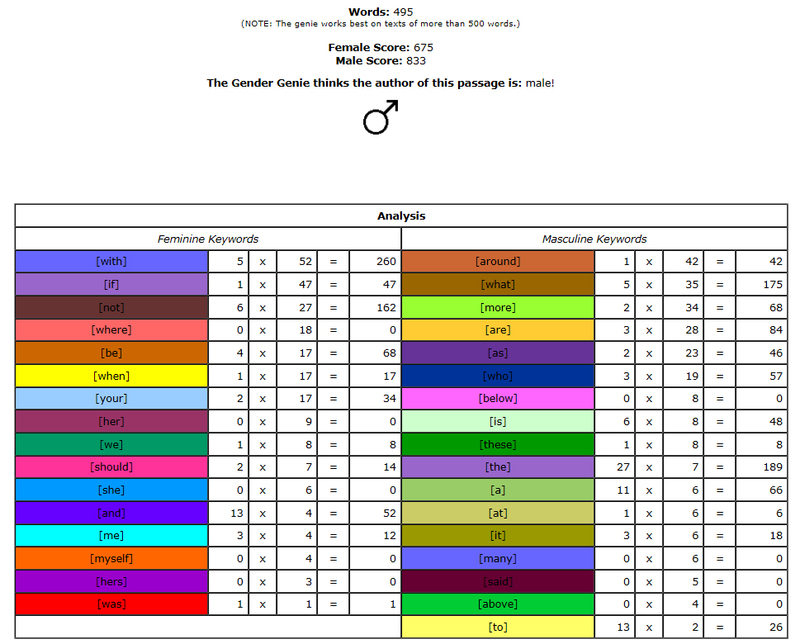 Today I discovered a fascinating tool called the Gender Genie thanks to Clarissa over at Clarissa’s Blog. 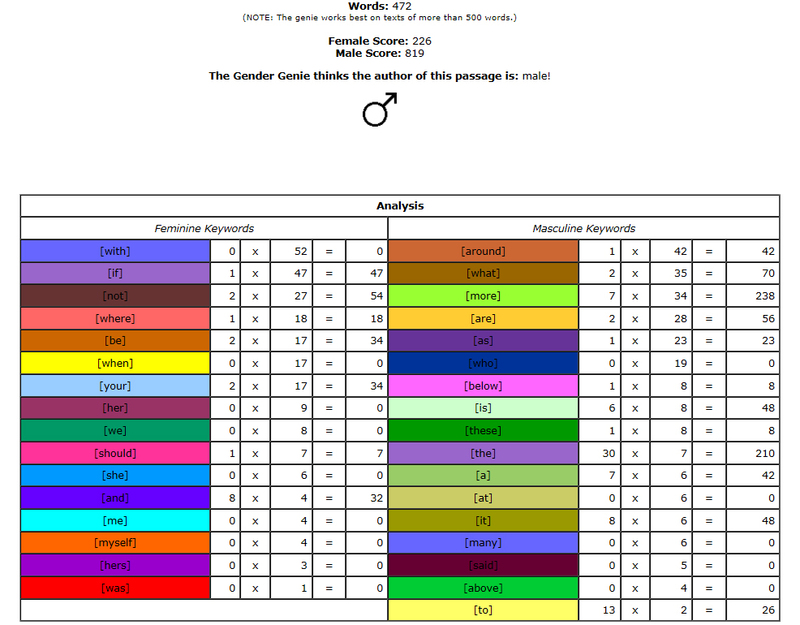 The tool purports to be able to predict one’s gender based on a sample of one’s writing. I decided to test the tool on three samples: 1) my blog post, “More“, 2) the 5,000+ word short story I entered into the Writers of the Future Contest, and 3) a writing sample from my wife. So, according to the Genie, I am married to a man. The bottom line is that my non-fiction writing is more masculine than my wife’s non-fiction writing, which, in turn, is more masculine than my fiction writing. In fact, I can quantify it. My non-fiction writing is over three times as masculine as my fiction writing. This entry was posted in Blogging, Humor, Predictions, Writing and tagged Gender Genie, Writers of the Future Contest. Bookmark the permalink. It starts to sound like the gender genie thinks the entire planet is populated exclusively by men. 🙂 Has anybody been told they have female writing? That was fun. Serious blog and essays classed me as male. More general blog clased me as female. Hmm. Good think you live in California, not Texas I guess. I am female and invariably every sample of my writing came up as HEAVILY male. Go figure. Very bizarre. I don’t think the Gender Genie works all that well. Huh, it got my gender right and I was actually trying to get it to think I was a guy (I wrote the story in first-person from a guy’s perspective). Dang it, the thing’s onto me.